Recovery Emulsion BACK TO GAME relieves from fatigue after sporting activity. It significantly accelerates regeneration thanks to a unique mixture of essential oils Tarchoplus, a premix of four minerals, sodium, potassium, magnesium and calcium Hydramineralis®, the complex of active substances CellActive®. It contains arnica, comfrey and chestnut extracts, rosemary and peppermint essences, arginine and extracts of Aloe vera. It supports natural body moisture, it cleans, nourishes and regenerates the skin. Rub into skin after performance. For greater effect, we recommend using our kick-starting emulsion ENERGY before doing sport. 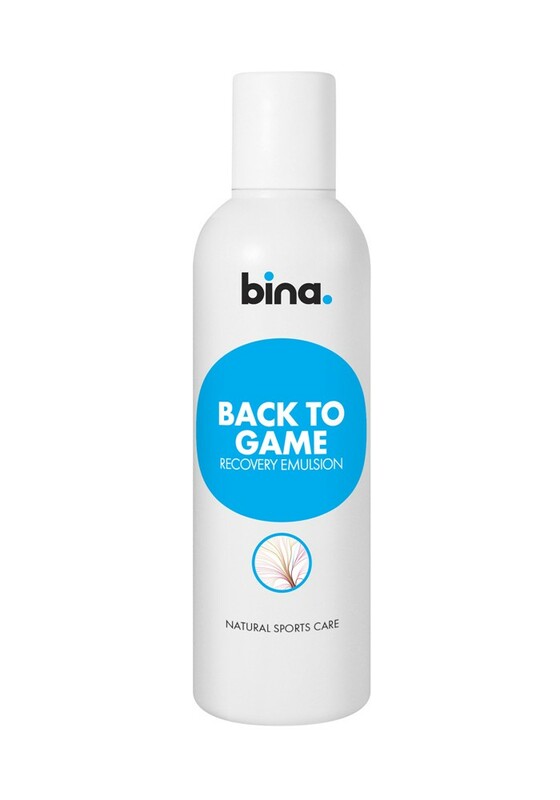 Then wash off what remains of the emulsion and other dirt with our gently energizing shower gel FRESH from the BINA sports cosmetics collection.